Built in 1919, the building at 701 Shipley is reflective of the Commercial Style architecture that developed in Wilmington during the early 20th century. The character of the building is mostly derived from the pattern and variety of large window bays on the two street facades. The design of the building, in terms of elevations, fenestration, construction technology and setting was driven more by the demands of early 20th century commerce than by aesthetics. 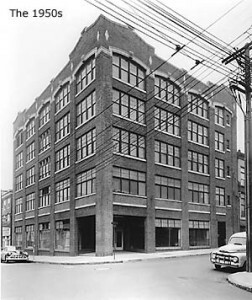 1936 – 1950 Sears Roebuck & Co. In 1992, the building was purchased by St. Andrews Episcopal church at 8th and Shipley, the neighbor at the other end of the block. The building was to be renovated into single unit housing for the homeless. Unfortunately, the major financial partner in this endeavor decided to drop out and St. Andrews did not have the funds to continue with the project. During the period from 1994 to 1996, St. Andrew’s consolidated with another Episcopal church in the city, St. Matthews, to become the Episcopal Church of Saints Andrew and Matthew [SsAM]. With that major change, developing plans for the building at 701 Shipley were put aside. In 1997, the Episcopal Church of Sts. Andrew and Matthew formed a task force to identify, explore and recommend options for the development of the vacant building at 701 Shipley. 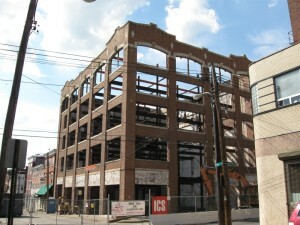 The development of this building was to be first step in a journey to rejuvenate this area of the city. In 1999, SsAM created the Shipley Village Community Development Corporation [SVCDC} as an entity whose mission was to help in the redevelopment of the block bordered by Shipley & Orange… 7th & 8th Streets in order to make the area more attractive and appealing to neighbors, city workers, shoppers, church goers, visitors, area students and possibly new residents. The building at 701 Shipley was the key to the initial success of that mission. The SVCDC investigated many alternatives for the use of the building located at 701 Shipley. It entered into relationships with developers in 1999 and again in 2001 with unsuccessful results. However, through the leadership of Canon Lloyd Casson, Rector of SsAM, and Chris White, former Warden of the Vestry at SsAM and Board Chair of the SVCDC, a viable building plan for 23 artist loft apartments with subsidized rents, a gallery and meeting space was developed. Funding was obtained through historic and low income housing credits as well as the generosity of several foundations, banks and the city of Wilmington. 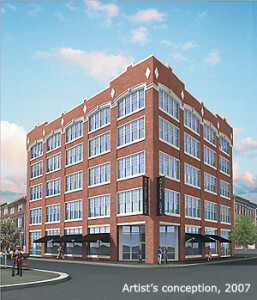 Shipley Lofts, 701 Shipley Street, opened in May, 2010. As a sad footnote, in April, 2010 several weeks before the official opening of Shipley Lofts, Chris White was killed by a hit and run driver whose car jumped the sidewalk a half a block from Shipley Lofts. Following his death, the gallery in Shipley Lofts was renamed the Chris White Gallery and the Shipley Village CDC was renamed the Chris White Community Development Corporation.